Robin and John Gumaelius incorporate steel, ceramic and wood to create animated human and birdlike sculptures. Robin creates all the colorful ceramic surface imagery and complex decorative glazes, and then John takes over and adds the exquisite metal armatures that bring the sculptures to life. 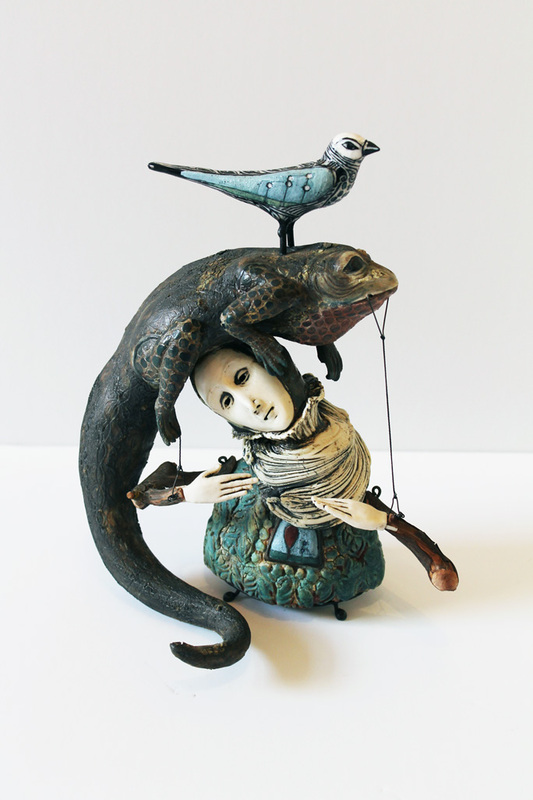 In a highly unusual working relationship, Robin and John combine their skills and imaginations together as an artistic team to build a singularly unusual world out of clay and metal. John says that "we begin by pressing clay into a crow-shaped mold, then cut, bend and build to alter that shape. We paint the entire figure with under-glazes then carve back through to the white clay. Watching clay peel away and images appear satisfies us; it gives immediate pleasure." Robin continues: "Radio stories, history books, biking adventures, gardening notes, neighbors spied, strangers watched in stores and parks and cars jangle together in our heads and come so freely to our fingers that when we see the pieces finished we are often delighted – as if we are not their creators; they just come to talk with us for a while and then leave again". John and Robin Gumaelius live in a tree house John recently built for the couple and their four children. In this wooded environment, the couple works in a slow ongoing conversation with each other. Each piece records a bit of their story.